People don’t think too much what's in their gas, so we talked about being confident in the quality of ARCO’s gas in a humorously memorable way. One confident act deserves another. 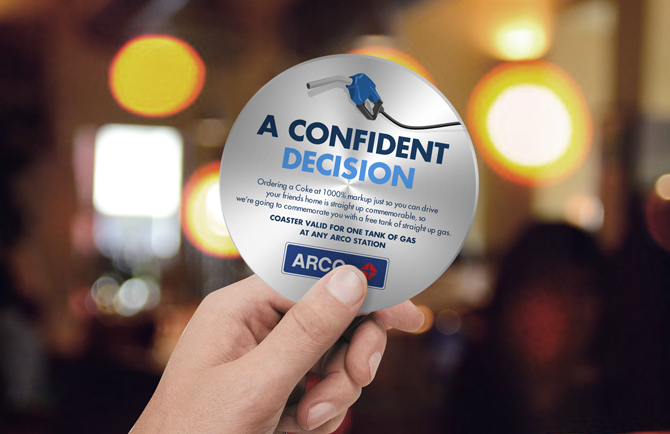 ARCO gave a free fill up to designated drivers, and commended those confident enough to be completely sober, drunk on sodas while their friends get blasted. 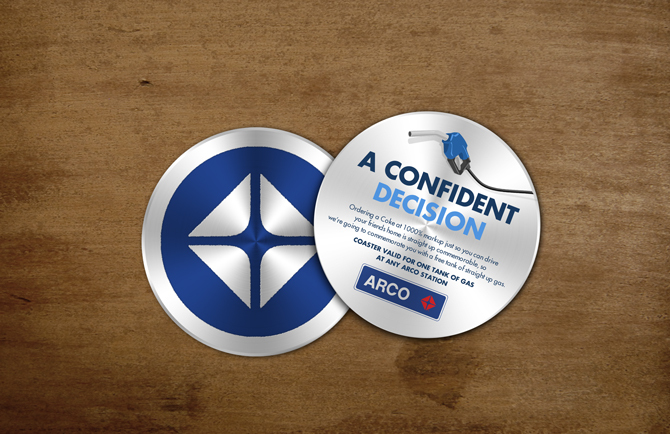 ARCO branded coasters were given to designated drivers who bought sodas at insane bar markups. These ARCO coasters were traded in for free ARCO gas. Those in the know, know a bit more about gas than just the pumping part. They know high quality ARCO gas helps keep their engine clean, but won’t rotate their tires. Unfortunately, no gas will. Confident drivers know how to turn a wrench to keep the wheels turning. These drivers keep some very cool cars on the road, and we’re going to give them some fuel to do so. The Confident Car Rescue program gave a tank of free gas to buyers who buy cars worthy of being fixed. We took this program to the biggest junkyard on the web, Craigslist. 350 of the coolest cars on Craigslist were chosen as part of the Confident Car Rescue program. Buyers who take up the challenge of fixing these cars were awarded a free tank of gas when they've successfully brought the car back to life. Worthy cars will be badged, and the code on badge redeems free tank of premium gas at ARCO.